PictureBox launches movies-on-demand player for Samsung Smart TVs | What Hi-Fi? Initially PictureBox player is available on compatible Samsung sets in the UK and Ireland, and will be expanded globally in due course. Subscribers to the new service will be able to access content on multiple connected devices through a single subscription. At any given time 28 curent and library films from NBC Universal and other content providers are available for on-demand viewing, many of which have not yet been aired on free-to-air television. Films are refreshed on a weekly basis. Current films available include Mamma Mia!, Charlie Wilson's War, Pride and Prejudice and The Tale of Despereaux. PictureBox player uses SyncTV cloud-based technology to stream over the internet. 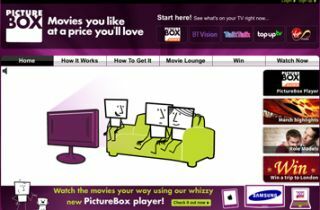 Originally launched in 2006, the PictureBox service operates on multiple platforms in the UK, including BT Vision, Virgin Media, Top-up TV and Talk Talk.